Set in the Old West in the 1870s, The Denton Mare is about the fabled Texan outlaw Sam Bass. Sam led a colorful and exciting life, the stuff legends and – nowadays – movies are made of. He held a daring robbery of the Union Pacific gold train in 1877 with a loot which, to this day, was the largest single robbery of Union Pacific. He managed to stay one step ahead of the law until, betrayed by a member of his gang, it finally caught up with him in a confrontation with the Texas Rangers. Author Duane DeMello’s novel primarily concerns itself with events in the train robber's life – from the time he owned and raced the Denton Mare to the now famous shoot-out in Round Rock, Texas. It is a fascinating fictionalized account of crime and betrayal told and seen through the eyes of Bass and one of his close confederates, Jim Murphy. 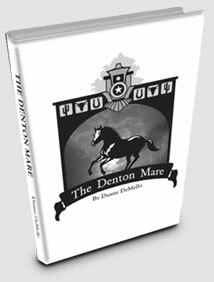 Get a glimpse of the Old West as DeMello vividly brings it back to life in The Denton Mare.